Vpr is one of the most enigmatic viral auxiliary proteins of HIV. During the past twenty years, several activities have been ascribed to this viral protein, but one, its ability to mediate cell cycle arrest at the G2 to M transition has been the most extensively studied. Nonetheless, the genuine role of Vpr and its pathophysiological relevance in the viral life cycle have remained mysterious. Recent work by Laguette et al. (Cell 156:134-145, 2014) provides important insight into the molecular mechanism of Vpr-mediated G2 arrest. This study highlights for the first time how Vpr recruits the SLX4 endonuclease complex and how Vpr-induced inappropriate activation of this complex leads to G2 arrest. Here, we will discuss these findings in the light of previous work to show how they change the view of Vpr’s mechanism of action. We will also discuss how these findings open new questions towards the understanding of the biological function of Vpr regarding innate immune sensing. HIV type 1 and type 2 primate lentiviruses encode a set of auxiliary proteins that differ between the two lentiviral lineages. Vpr, Nef and Vif are expressed by both the HIV-1/SIVcpz and HIV-2/SIVsmm lineages, while Vpu is specific to the former and Vpx to the latter. These auxiliary proteins play a crucial role at the host-virus interface by modulating the intracellular micro-environment in favor of viral infection and dissemination . So far, much work conducted to decipher their mechanism of action has helped to understand the molecular steps faced by HIV during the viral life cycle. Most HIV auxiliary proteins use the same strategy, i.e. hijacking a ubiquitin ligase complex, to target cellular proteins, the so-called restriction factors, for proteasome-mediated degradation. This is how HIV-1 Vpu, Vif or HIV-2/SIVsmm Vpx counteract tetherin/BST-2, APOBEC3G and SAMHD1 respectively . Each cellular target displays specific and potent antiviral activity; de facto, some in vitro systems, in which the restriction factor is expressed, can recapitulate the dependence of infection on the viral protein. Alike Vpu, Vif or Vpx, we and others have previously shown that HIV-1 Vpr is also able to recruit a ubiquitin ligase complex, but the significance of such an interaction has remained unknown . Expression of Vpr in cycling cells triggers cell cycle arrest at the G2 phase, prior to mitosis. Vpr-mediated G2 arrest was revealed in 1995 by several groups - and represents the most widely described property of the viral protein. However, the biological significance of this activity towards infection has been unclear for years given that efficient viral replication does not require Vpr in dividing cells. Paradoxically, a lack of Vpr slightly affects viral infection in macrophages that do not divide -, suggesting that Vpr-mediated cell cycle arrest is irrelevant to its role towards infection in these cells. The recent study by Laguette and collaborators  provides new information on the G2-arrest mechanism induced by Vpr by highlighting its connection with the SLX4 endonuclease complex (SLX4com), and in addition, reports a potential anti-immune role for Vpr via this interaction. In an attempt to decipher the molecular mechanisms underlying Vpr-mediated G2 arrest, several studies have reported that this activity depends on the DNA damage checkpoint network. This pathway involves the activation of ATR (Ataxia Telangiectasia-mutated and Rad3-related) and Chk1 kinases and ends-up with the inactivation of the cyclinB-Cdk1 complex, which governs mitosis entry -. In cooperation with its downstream effectors, ATR preserves genome stability, in particular by helping stalled replication forks to proceed following genotoxic stress . Vpr-mediated induction of replication stress was observed in transformed cell lines but also in primary CD4+ T cells and correlates with the accumulation of replication protein A, which binds single stranded DNA following replication stress . In good agreement, the pathway used by Vpr was also shown to result from an S phase-dependent mechanism and to involve association of Vpr with chromatin ,-. Yet, the precise mechanism by which Vpr caused DNA replication stress and the role of this stress during the course of the infection has remained elusive. In 2007, Vpr binding protein (VprBP), later on renamed DCAF1 for DDB1-Cul4A-associated factor 1 (DDB1: DNA damage-binding protein 1, Cul4A: Cullin 4A) was recognized as a critical host factor in the ability of Vpr to trigger cell cycle arrest ,-. Prior to this, DCAF1/VprBP was first identified as a cellular protein binding to Vpr with high affinity  and ten years after, characterized as an adaptor of DDB1-Cul4 ubiquitin ligases -. The data collectively obtained by the different groups supported a model ,- in which Vpr simultaneously recruits the Cul4A ubiquitin ligase through DCAF1 and a so far unknown cellular protein required for entry into mitosis. As a result, the Vpr target protein was supposed to be ubiquitinated and degraded to subsequently trigger G2 arrest. Vpr itself was predicted to escape from DCAF1-induced degradation and even to be stabilized by its association with the Cul4A-DDB1 ubiquitin ligase . In view of the model of ubiquitin ligase hijacking for the benefit of the viral cycle, we and others have hypothesized that the function of Vpr was dependent on the degradation of a specific host protein rather than the resulting G2 arrest that could be a side effect in cycling cells. In this case, we expected the host target of Vpr to be a negative factor for viral replication . For many investigators, identification of the host protein(s) targeted for degradation by Vpr became a priority toward understanding the genuine function of this viral protein. Following tandem affinity purification, immunoprecipitation and mass spectrometry, Laguette et al. identified structure-specific endonucleases (SSEs), namely ERCC1-ERCC4/XPF and MUS81-EME1, together with the SLX4 scaffold protein as new Vpr interacting partners . Glycerol gradient sedimentation and co-immunoprecipitation studies confirmed that SLX4 subunits, DCAF1 and Vpr assemble into a single complex. SLX4, also known as BTBD12, was renamed FANCP, when biallelic mutations in the SLX4 gene were associated with Fanconi anemia (FA), an autosomal recessive genetic disorder characterized by congenital abnormalities, bone marrow failure and cancer susceptibility -. SLX4 provides a molecular platform to form a complex (SLX4com) with several SSEs, ERCC1-ERCC4/XPF, MUS81-EME1, but also SLX1, and stimulates their activities to coordinate the repair of specific replication-born double strand breaks (DSBs) and collapsed replication forks -. MUS81-EME1 and SLX1 are specifically dedicated to the resolution of replication-induced X-shaped DNA structures, the so-called Holliday Junctions, during homologous recombination -. These SSEs are submitted to strict regulations along the cell cycle to ensure the formation of an active complex at the right time and subsequently the removing of inadequate DNA recombination intermediates before chromosome segregation ,- (Figure 1). Laguette et al. observed that Vpr induces a slight decrease in EME1 and MUS81 expression and an increase in the levels of polo-like kinase 1 (PLK1) and phospho-PLK1, a kinase that activates the endonuclease activity of EME1 through its phosphorylation ,. In parallel, Vpr caused a remodeling of SLX4com through its association with phospho-EME1 and the DCAF1 ubiquitin ligase (Figure 1). Importantly, time course experiments led to the conclusion that Vpr-induced activation of SLX4com precedes G2/M arrest and is not a consequence of the cell cycle arrest per se. In addition, SLX4 purified in the presence of Vpr had increased cleavage activity toward radiolabelled DNA substrates as compared to the endonuclease in the absence of Vpr. Interestingly, Vpr-mediated increase of SLX4com activity was abolished when MUS81 expression was silenced. Importantly also, downregulation of SLX4, EME1 or MUS81 expression inhibited Vpr-mediated G2 arrest, which has been recently confirmed by Berger et al. . Collectively, the data support a model in which Vpr induces the premature activation of SLX4com, leading to replication stress as asserted by the appearance of FANCD2 foci . Consequently, the abnormal cleavage of DNA replication intermediates would presumably cause a G2 arrest. It is unclear yet whether this process is related to previous observations suggesting that Vpr induces double-strand breaks (DSB) formation or that MUS81 plays a role in the formation of such breaks in response to the inhibition of replication ,. Moreover, the interaction of SLX4com with chromatin in the presence or not of Vpr remains to be evaluated. Model for Vpr-mediated G2 arrest through remodeling of the SLX4 complex. In a physiological contex activation of the SLX4 complex (SLX4com) intervenes to allow the resolution of DNA replication intermediates, such as Holliday Junctions (HJ), found in collapsed replication forks after DNA replication (phases of SLX4 activation are symbolized by green arrows). This leads to a proper G2/M phase transition (left panel). HIV-1 Vpr protein interacts with SLX4 on its SLX1 binding domain, the CUL4A–DDB1DCAF1 ubiquitin ligase and PLK1/p-PLK1. These interactions lead to MUS81 ubiquitination, and phosphorylation of EME1 by p-PLK1, resulting in aberrant activation of SLX4com. This inappropriate activation perturbs progression of ongoing replication forks (RF) in S phase and the resolution of abnormal DNA replication intermediates. As a consequence, cells arrest at the G2 phase of the cell cycle (right panel). The Vpr-binding protein DCAF1 was also present in association with SLX4 and this interaction was enhanced with Vpr. Given its role in Vpr-mediated G2 arrest, the role of DCAF1 in SLX4com activation was further investigated. Silencing of DCAF1 reduced the accumulation of PLK1 and Phospho-PLK1 seen in the presence of Vpr and inhibited the reduction in MUS81 levels. In addition, more ubiquitinated MUS81 species were detected with wt Vpr, by comparing with the DCAF1-binding deficient Vpr mutant (Q65R), which did not induce FANCD2 foci accumulation. Nonetheless, whether the proteasome pathway is involved in this process remains to be investigated with the use, for example, of proteasome inhibitors. Altogether the results suggest that Vpr uses DCAF1 for SLX4com activation and reduction of MUS81 levels. Vpr-mediated downregulation of MUS81 expression seems relatively inefficient. One explanation could be that degradation occurs in a short window of cell cycle progression, just before G2/M, making it difficult to highlight in asynchronous cells. Moreover, how degradation of MUS81 intervenes in the process of SLX4com activation remains unclear. 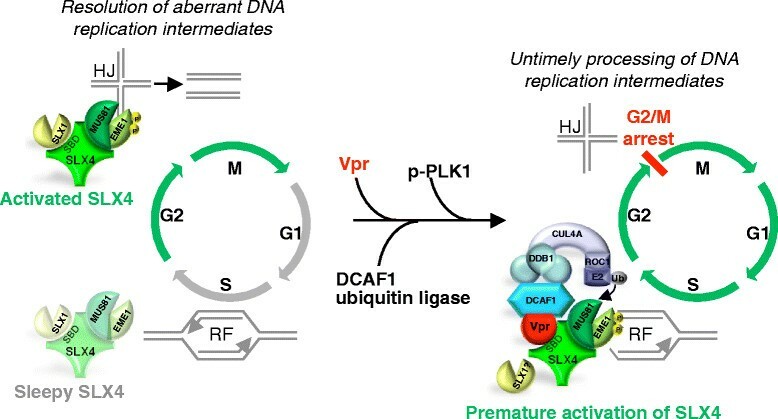 As a viral protein hijacking a ubiquitin ligase, Vpr was initially thought to trigger the degradation of an antiviral factor. Here, the ubiquitination and the downregulation of MUS81 by Vpr could lead to envision it as a potential antiviral factor counteracted by Vpr and whose degradation would lead to G2 arrest. However, this is not the case, MUS81 depletion does not mimic a G2 arrest phenotype and MUS81 or SLX4 depletion reduces viral infection, which indicates their positive role for the viral life cycle. Nonetheless, it is intriguing that MUS81 is both required for G2 arrest and also inactivated by Vpr through DCAF1. Further studies will help to understand the orchestration of these different events. Though the SLX1 SSE does not co-purify with Vpr and SLX4, SLX1 seems to participate in Vpr-mediated G2 arrest. Indeed, depletion of SLX1 reduces the ability of Vpr to mediate G2 arrest. In addition, purified SLX4com isolated from Vpr expressing cells still processes SLX1 substrates. Of note, Vpr interacts with the SLX1 binding domain of SLX4, which may indicate that interaction of SLX4 with SLX1 and with Vpr are exclusive. These apparently contradictory findings may reflect that a series of complex and successive events are involved in Vpr-mediated SLX4 activation. Recent work by Berger et al. further supports a role of SLX4, MUS81 and EME1 in Vpr-mediated G2 arrest . Interestingly, SIV Vpr alleles competent for G2 arrest in human cells interact with human SLX4, but not alleles incompetent for G2 arrest in those cells. SIV Vpr alleles competent for G2 arrest in Grivet cells, but not in human cells, interact with simian SLX4. This species-specificity in Vpr-mediated G2 arrest supports the idea of a central role of SLX4 in Vpr function. Altogether the results by Laguette et al. support a model in which Vpr forces activation of the SLX4 complex, rather than supporting the previous model in which Vpr eliminates an antiviral factor. Nonetheless, we are tempted to put forward the hypothesis that the two models could be reconciled in a model in which Vpr would for example induce the degradation of an inhibitor of SLX4 activation that has potent antiviral activity. Persistent viruses such as HIV are known to interfere with the overall immune host response . The role of Vpr in this context has been studied by several groups. Namely, two reports have previously demonstrated that Vpr decreases the expression of IRF3, an essential protein for interferon (IFN) beta production in response to viral infection ,. Furthermore, numerous immunosuppressive activities of Vpr have been identified, including its capacity to perturb the Th1 lymphocytes activity or the Treg homeostasis ,. Altogether, these studies highlight a new capacity of Vpr to participate in the viral persistence by hindering the appropriate cooperation between immune cells. In Laguette et al., deletion of Vpr induces a 2 to 3 fold increase of the expression of mRNA of the type 1 interferon response (IFNα, IFNβ and MxA) upon HIV-1 infection in HeLa cells, supporting the notion that Vpr could contribute to HIV-1 escape from innate immune sensing. Nonetheless, whether reduction in IFN-related mRNAs in the presence of Vpr is related to SLX4 remains difficult to assess since deletion of SLX4 or MUS81 alone leads to a huge increase of the same mRNAs. Interestingly though, the authors showed that HIV-1 DNA products of reverse transcription are pulled down with epitope-tagged SLX4 specifically in the presence of Vpr and that reduction of SLX4 expression leads to an increase in HIV-1 DNA levels. These results suggest that Vpr could help to escape immune sensing by inducing the digestion of viral DNA through SLX4com activation (Figure 2). Model for Vpr-mediated evasion from immune sensing. The model envisioned by Laguette et al. proposes that HIV DNA forms accumulate following infection by a Vpr-deleted HIV-1 virus (HIV-1∆Vpr). These forms, that are not characterized, are sensed by a DNA immune sensor to generate an IFN response (left panel). A Vpr encoding HIV-1 virus would instead force the SLX4com endonuclease activity. The subsequent processing of extra reverse transcription products would help to prevent their accumulation and allow escape from immune sensing (right panel). How does SLX4com distinguish between the unproductive and the productively infecting RT intermediates is unknown. In addition, whether Vpr increases the efficiency of viral infection by activating SLX4 has not been investigated yet. Surprisingly, the increase in HIV-1 DNA levels under SLX4 knock-down is not associated with an increase in HIV-1 infection, however it should be stressed that the forms accumulated under SLX4 knock-down are not fully characterized yet and could correspond to abortive products of reverse transcription. It is also puzzling that no RT product is detected in the SLX4 immunoprecipitate a few hours after infection as we could expect from previous studies . Given the presence of SLX4 into the nucleus, its association with 1/2LTR circles or even proviruses would be worth to look at deeply. In a model in which SLX4 would play a role in the escape from immune sensing by digesting viral DNA, depletion of SLX4 should reduce viral infection. Accordingly, cells from FANCP patients or MEF cells depleted for SLX4 displayed high levels of IFNα, IFNβ and Mxa mRNA and a decreased permissivity to viral transduction. Of note, the decrease in HIV-1 infection under SLX4 depletion was seen in patient samples but not in HeLa cells depleted for SLX4 or MUS81. Why the high increase in IFN-related mRNAs in HeLa cells does not correlate with an inhibition of HIV-1 transduction in these same cells is puzzling. In other circumstances, production of IFN inhibits HIV-1 transduction in single-cycle infection experiments, for instance following depletion of the TREX1 endonuclase . Several hypotheses can account for the lack of effect of Vpr on HIV-1 infection in HeLa cells. Though an effect on IFN-related mRNA levels is detected, it is likely that this effect does not lead to efficient interferon production, as it could be the case in other primary cells. Alternatively, the production of IFN might be too weak to have a negative effect on single-round infection, but would be cumulative in a spreading infection using replicative viruses. In this setting also, it is likely that HeLa cells do not have all the connections that allow efficient IFN signaling for subsequent HIV-1 infection inhibition. Surprisingly, a recent report has provided evidence that HIV-1 Vpr induces Interferon-Stimulated Genes (ISG) and helps to activate innate immune response in non-infected macrophages . These apparent discrepancies may result from the use of different cellular systems, non-infected macrophages versus infected Hela cells. Further experiments by additional investigators will help to draw a clearer picture of what is going on under Vpr treatment in different cell types. Previous work has demonstrated how a subset of Vpr proteins from lentiviruses lacking the auxiliary protein Vpx were still able to degrade the antiviral factor SAMHD1 as well as Vpx from HIV-2/SIVsmm/SIVmac -. Alike SLX4, SAMHD1 modulates the DNA damage response . Mutations of SAMHD1 are found in the Aicardi-Goutières syndrome (AGS), a rare autosomal recessive genetic encephalopathy characterized by high levels of IFN leading to chronic inflammation . Several studies indicate that SAMHD1 limits proinflammatory cytokine production and immune detection -. Inhibition of the immune sensing of HIV-1 through SAMHD1 results from the dNTPase activity of the protein, which contributes to the removal of nucleotides essential for viral cDNA synthesis in myeloid cells and quiescent CD4+ T cells, but could also potentially results from its recently identified RNAse activity -. Nonetheless, HIV-2/SIVsmm/SIVmac and a subset of other lentiviruses have kept the ability to degrade SAMHD1, in order to increase dNTP levels for efficient reverse transcription, even at the expense of the possibility to escape immune detection. Strikingly, HIV-1 Vpr and HIV-2/SIVsmm Vpx seem to function in opposite directions with respect to immune sensing. Altogether, by having no Vpx but one Vpr, HIV-1 has significant assets to escape immune detection compared to HIV-2. In addition, HIV-2 capsid harbors a major determinant for viral cDNA sensing, while HIV-1 capsid has been shown to prevent sensing or even to bind specific cofactors to evade immune detection -. 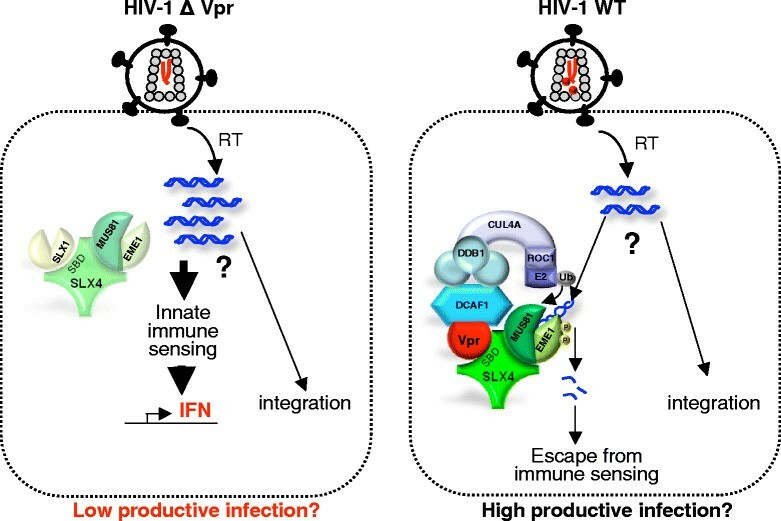 Differences in escape from immune sensing likely contribute to the different pathogenic outcomes associated with the two viruses, HIV-1 being far more pathogenic than HIV-2 . Other host proteins than SAMHD1 contribute to limit the sensing of viral nucleic acids, including RNASEH2, which degrades DNA:RNA hybrids or TREX1, which eliminates viral DNA in excess -. Importantly, genes encoding for TREX1 and RNASEH2 are also mutated in the Aicardi-Goutière syndrome (AGS), highlighting how these proteins provide a link between autoimmunity and nucleic acid metabolism ,,-. This is also supported by their capacity to control endogenous retrotransposition -. An interesting possibility is that endogenous retroelements, alike abnormal replication intermediates, could trigger the activation of SLX4, a mechanism that would in turn lead to chronic inflammation in FA disease. Once activated, how does SLX4 distinguish “good DNA” that will lead to productive infection, from “bad DNA” that will be destroyed? Such a question has already been brought up regarding TREX1 . One hypothesis is that only non-productive short DNA generated by errors during reverse transcription may be targeted by nucleases. Alternatively, access to the viral DNA may be governed by the stability of the capsid core that is implicated in the control of reverse transcription -. In any event, identification of immune sensors associated to this process should improve our understanding of how HIV-1 escapes from the innate immune response. Whether the recently identified DNA sensors of HIV are specifically recruited in the absence of Vpr but not in its presence should be further addressed ,,. Another intriguing question concerns the presence or not of a signature of positive selection in SLX4. Such signature characterizes restriction factors and corresponds to variations in their sequences at the interface with the viral protein, reflecting an evolutionary arms-race between the virus and its host . Recent work has shown how these sequence variations contribute to host susceptibility to viral infection. Here regarding the interplay between Vpr and SLX4, we are facing a new situation since SLX4 is not an antiviral factor, but is rather beneficial for the virus. One may speculate that co-evolution would push SLX4 to avoid Vpr in order to restore an immune response, while Vpr would evolve to conserve its association with SLX4. Future work should aim at elucidating whether Vpr provides an advantage to viral infection by activating SLX4. Thus, an important issue is to analyze whether the delta-Vpr HIV-1 virus is similarly infectious in cells depleted or not of SLX4 as the wt virus in SLX4−/− cells. The limiting factor in such study is the choice of a cellular system in which Vpr would clearly increase viral infection. So far, macrophages have represented an appropriate system, since in these cells, Vpr-deficient HIV-1 showed a slight replication defect -. In contrast to previous findings, one study has also reported that Vpr is able to enhance HIV-1 infection in peripheral blood mononuclear cells and dendritic cells . More studies are needed to assess what is the best in vitro cellular model in which replication would depend on the presence of Vpr. In macrophages, the question of the presence of SLX4 and the associated nucleases has to be addressed before wondering whether Vpr-mediated enhancement of macrophage infection is linked to the activity of SLX4com. Of note, Zimmerman et al. previously found that HIV-1 Vpr fails to induce activation of the ATR pathway in macrophages, due to the lack of protein expression of at least ATR, Chk1 and Rad17 . However, the question is still open regarding SLX4com. If SLX4 drives HIV-1 Vpr function in certain cell types such as macrophages, then, one would like to know whether differences of Vpr alleles to activate SLX4 correlate with different capabilities to help macrophage infection. The study from Laguette et al. provides important insights into the mechanism of Vpr-mediated G2 arrest with the identification of SLX4com as a new functional partner of Vpr. This discovery also opens new avenues to understand the biological role for Vpr along the viral life cycle. The idea that HIV may have developed a protein to induce the degradation of its own viral DNA leads to the intriguing questions of how the virus can achieve the right balance between preservation of viral DNA synthesis and escape from immune sensing through viral DNA degradation. In recent years, immune sensing has taken on a growing role in our understanding of the battle between the virus and the cell, making it important to identify the molecular players at stake such as SLX4com. Research associated to other diseases, namely AGS and FA, will certainly benefit from these discoveries. The authors fully apologize to those who have not been referenced. The authors greatly acknowledge Cecilia Ramirez and Claudine Pique for carefully reading this manuscript and providing constructive comments. This work was supported by grants from the “Agence Nationale de la Recherche sur le SIDA et les hépatites virales” (ANRS), Sidaction and “Fondation de France”, Fondation pour la Recherche Médicale (FRM). MLB received support from ANRS, HL from Sidaction, LD from the University Paris Descartes and the “Ministère de l’Enseignement Supérieur et de la Recherche”. FMG wrote the review. MLB, LD, HL conceived the illustrations and were involved in discussions and critical reading of the manuscript. All authors read and approved the final manuscript.